Dailies Total1 Multifocal are made from advanced silicone-hydrogel material. They are equipped with special technology that ensures high water content and optimal oxygen permeability for comfort and clarity throughout the day. Dailies TOTAL1 Multifocal are daily, silicone hydrogel lenses from renowned manufacturer Alcon. They are intended for users affected by presbyopia. The lenses’ production technology combines classic hydrogel material, which contains a high amount of water, with silicone hydrogel, which allows a sufficient amount of oxygen to reach the cornea. This is known as oxygen permeability. This package contains 30 lenses. Their patented Precision Profile Design provides seamless vision at all distances – near, far, and middle distances. Additionally, the lenses’ water gradient system distributes moisture evenly for all-day comfort. 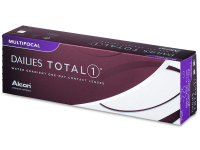 We also offer Dailies Total1 Multifocal in a pack of 90 lenses at a bargain price. Dailies TOTAL1 Multifocal are daily disposable lenses. Simply wear a new pair each day and discard after use. Compared to monthly or bi-weekly lenses, daily lenses present the most hygienic option for contact lens wear. Great price and fast delivery. As a new contact lens user with a small prescription ( +1 and +0.5, low add), I found these lenses super comfortable with great vision for distance, driving plus reading and computer work. Found my vision much better with these than Acuvue Moist multifocals but the downside is that they are expensive. I often get dry eyes but these are good multi-focal lenses for me, they stay pretty moist and comfortable for most of the day. Every now and then I put in eye drops late in the day to make sure they stay moist when i'm working late. Hi my acuvue moist multifocal are left eye +1.5 mid +1.75 And right eye +2 low +1.25 what is the dailies equivalent? Dear Fred, the closest approximate counterpart would be mid +2.00, and low +1.25. We encourage you to check with your local optician. Hi my prescription is distance - 4.25 in both eyes with near sight being -2.50 and would like to buy the multi focal dailies total one but can’t seem to fill in order form correctly many thanks Tim White. Thank you for your recent comment. Unfortunately, it is not possible to have multifocal lenses with this prescription. Could it maybe be toric lenses that you would be looking for? or is it possible the added power is +2.50? Contact us on info@alensa.co.uk and we can help you find suitable lenses.